Our holiday was at the end of the season so the resort was very quiet. Agia Marina has a busy main road travelling right through the middle making it quite 'hairy' to negotiate crossing. There are several restaurants and shops selling the usual beach stuff etc but nothing more upmarket.Many of the restaurants had either closed or were in the process of closing for the end of the season so there was little or nothing to do in the evening. The area down from our hotel was not at all clean and there were bins that remained overflowing and unemptied all week. We only took a glimpse at the beach which again looked dirty and uncared for. All in all very disappointing.The saving grace was the local bus in to Chania where we spent several days sitting around the pretty harbour and looking at the lovely little shops in the old Venetian quarter.If we were going to Crete again we would consider staying in one of the many pension houses that are in this area. General cleanliness was quite good but there is no entertainment outside of the hotels along the seafront. There are only a couple of Tavernas along the front as we think the hotels were all inclusive thereby not needing eateries.Prices were reasonable and certainly cheaper than the apartments away from the seafront. A large beer could be had for two and a half euros if you call £2 cheap for a Greek beer.Hersonnisos is the nearest town and only 5 mins away on a bus. Taxis seem to cost a standard minimum of 8 euros which is good if there are four of you.The beach appears to be man made with gritty sand poured over rocks and it is difficult to get into the sea. Boat trips from Hersonnisos with El Greco were a rare treat, a great half day out. The resort was good. Nice to visit, will consider visting Crete (Hersonissos) again next year. Beach was very nice- a short walk away! You also have to survive passing th eanimal sto get there! We wouldnt visit here again. We booked a trip to Water City, the rep said to wait at the hotel 600 meters away which was ok. A very doggy old looking jeep turned up, the gentleman didn't speak a word of English, he just expected us the read his paper work. 5 minutes later he pulls up at a bus stop and says wait there for 10 minutes. 45 minutes later, again a really old coach turned up with a man shouting Water City, Water City. This holiday company is just a joke!! The hotel was in a quiet location, in the middle of a very lovely greek village, Anissaras. Hersinisos is the nearest town which is definately worth a visit both in the day time and at night. It will cost about 7euros for a taxi. 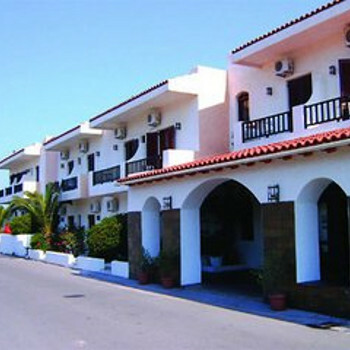 The resort of Malia is also a short taxi ride away although the price does increase to 20euros. If you are intending to visit Maila a number of times during your stay we reccomend staying at a hotel nearer this resort. We hired a car during our stay and world recommend this as we could see alot more of Crete which is a lovely island. Hiring a car is easy and cheap. You'll find it no trouble to find a car hire company as they are everwhere and reception are happy to help you talk to the hire company. We had picked this hotel because of its location. We wanted a peaceful hotel not in a busy town as we wanted to be able to get a decent nights sleep. The hotel was situated 5k from Hersonosis so a bus or taxi is need to get there but to get peace and quiet you have to be that far away. The was a nice sandy beach not far away, it was quite a walk but it did say so in the brochure. The resort was very clean. The beach was a little stoney, but suited us as a family. The beaches around Hersonnisos were not very good, you have to go 4-5 miles for a decent beach, ok if you have a car. We used to go to Tomprouk beach which is near Iraklion but its only about 15 mins drive, I am told star beach is quite nice which is near Stalis, but the beach immediately below ht Galini Hotel is absolute rubbish.